What You'll Need: scriptures, GAK 212/GAB 39: The Sermon on the Mount, GAK 240/GAB 1: Jesus the Christ, house printouts, clear packing tape, scissors, medium size rock, sand (available at craft stores OR substitute white sugar), two pie plates (or plastic disposable plate with rims), small cup filled with water. 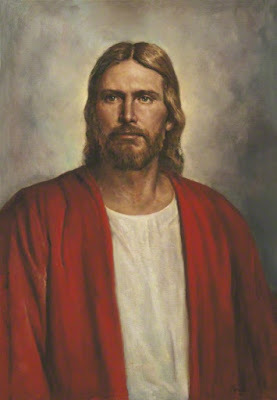 Quote: Neil L. Anderson - "The stories of Jesus shared over and over bring faith in the Lord Jesus Christ and strength to the foundation of testimony." When Jesus was on the earth, He traveled around the land of Jerusalem and taught people how to be happy. He taught them that they should be a good example to the world. He taught them that it was wrong to be angry with or hate anyone, even their enemies. He taught the principles of prayer, forgiveness and kindness. 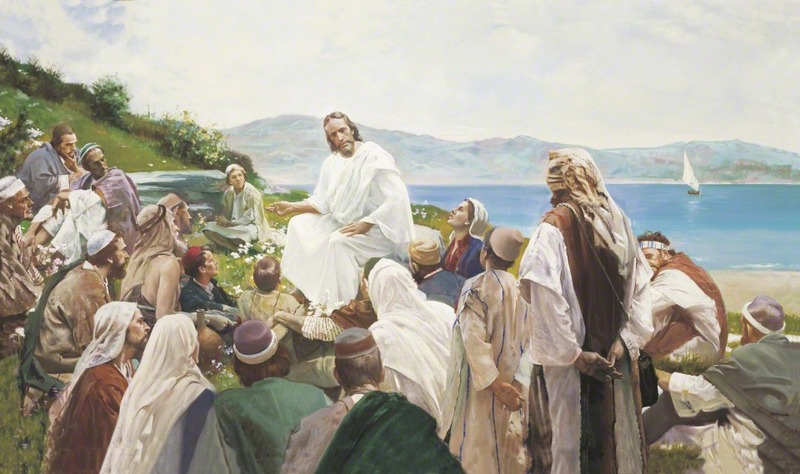 One day, Jesus was teaching his Apostles. He said that to live with Him in the kingdom of heaven, His disciples needed to learn the gospel and to live it. He then told them a special kind of story, called a PARABLE, which teaches us a lesson by telling a story first and then explaining how the story can help us choose the right. The story he told them is called The Parable of the Wise Man and the Foolish Man. 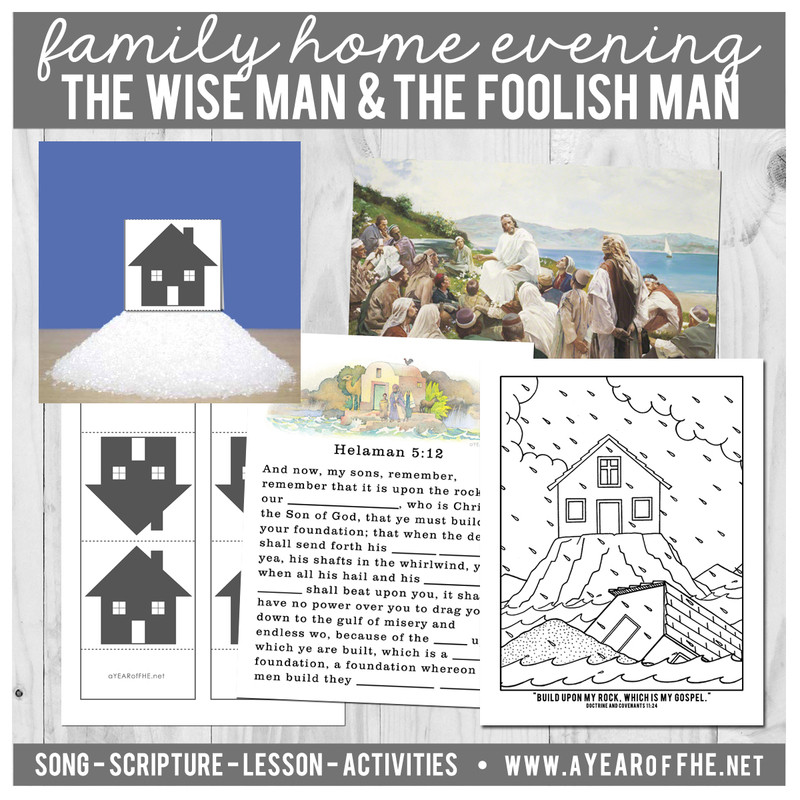 Jesus told them a story about a Wise (or very smart) Man who built his house upon a strong rock. And then there was a big storm. There was wind and rain and floods, but the house built on the rock was okay because it was built on something so strong. Then Jesus told them about a Foolish (or not very smart) Man who also built a house, but he built his house on sand. And then there was a big storm. There was wind and rain and floods, and the house built on the sand washed away with the water because it was built on something not strong. Then Jesus explained the story to them. He said that people who choose to make choices based on the teachings of Jesus will always be safe and strong, because Jesus is like the strong rock. And when our lives become difficult or we face the consequences of our good choices we will be safe and happy. Jesus said that people who choose to make wrong choices and ignore the teachings of Jesus will not be safe. When our lives become difficult or we face the consequences of our bad choices we will not be happy and sometimes we may suffer for our choices. Bear your testimony about a specific time in your life when storms raged around you and you were able to overcome because of your testimony in Jesus Christ. Thanks again for the wonderful lessons. They are so nice and at my children's level. Btw, I thought you did an awesome on the news, such an inspiration!! 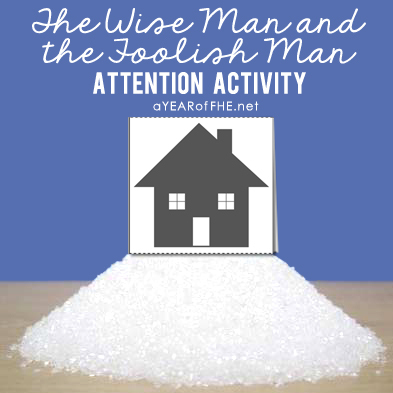 Just found your wonderful site and am using "The wise man and the Foolish Man" lesson tonight for FHE. My little boy is autistic and it is sometimes very difficult to engage him and get him to participate in FHE. 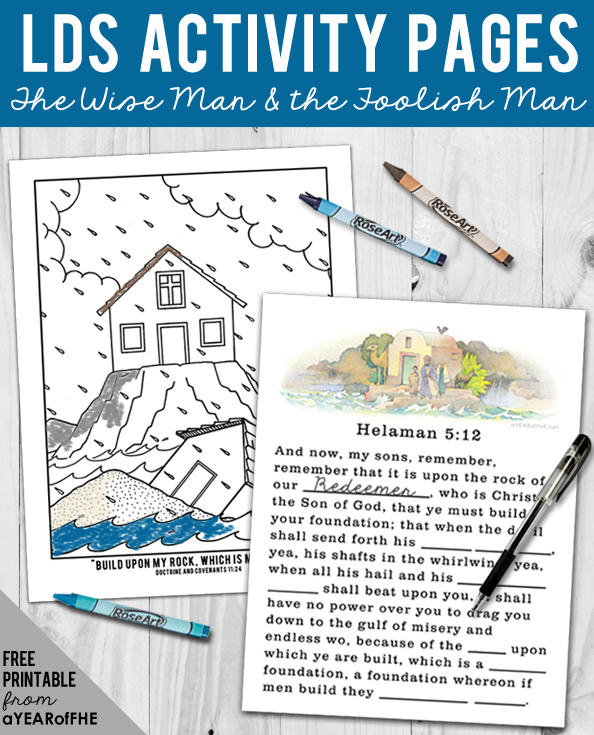 He absolutely loves the above Primary song and I know he will love this lesson. Thank you again. Thank you again as well! I really appreciate your work and effort to help more than just your family try to hold regular family home evenings! It helps!! You are awesome and amazing! Thanks for your hard work! I will admit that I have been lazy with FHE and am looking forward to being more consistent!! I love the object lesson. My kids will be sooo excited when I pull this out tonight!! Thanks so much!! I found your site awhile ago, but we haven't really used it. I'm making a goal to have FHE every week and I know by using your site I'll be able to accomplish it. Thank you so much for the hard work you do by putting these lessons together! Thanks so much for taking the stress out of planning a meaningful FHE for my family! This lesson is great! I love the object lesson to go with it. When I saw the supplies, I immediately thought it would be the whole filling a jar with rocks and sand, and you have to put the rocks in first. It was a pleasant surprise that it wasn't that idea (although it is a good one, I just see it a lot). I think this will be even more fun for the kids! Thank you. Thank you so much! I am trying to be consistent and good about Fhe and your site came as a blessing, I'm using this lesson tomorrow, my first day of doing things right! Thank you! My girls will love it I'm sure. My little 3 year old keeps singing the song about the Wiseman and the Foolish man. I think this lesson will keep her attention!! Thank you! Thank you! I was trying to explain this parable to my kids and totally confused them by telling them Jesus was like a rock. My daughter asked, "But he can talk right?" Hopefully this will help me clear things up! You're so awesome, thanks for sharing your lessons. Great for kids! Thank you! Thank you so much for sharing your lessons. I appreciate your effort and inspiration. I'm excited to teach one of them to my boys. Thank you again! My kids love your lessons! Thank you again for your amazing website. I keep coming back. We will be using this one later this month along with the Our Feelings lesson! Thank you for this lesson! I like the condensed story that my 6 year old can read to the family. Great job! I love your lessons! I can't seem to get the PDF for this one though... it says it can't be found when I click on the link.